a. Must citizen of Bangladeshi by birth. b. Students who have passed the HSC or equivalent Science examinations pass at 2016, 2017 and 2018.
c. For HSC/equivalent (Science)examinations for all education programs in country and abroad will be at least 6.00. But can not be alone under GPA 2.50.
d. Candidate must be unmarried. Please collect at Armed Forces Medical Institute (AFMI) , Dhaka Cantonment, Dhaka. Armed Forces Medical Institute (AFMI) authority will give you admit card 18/11/2018 . Also you can collect till 22/11/2018 at Armed Forces Medical Institute (AFMI) , Dhaka Cantonment. Armed Forces Medical Institute (AFMI) , Dhaka Cantonment authority will be published at their Notice Board. Armed Forces Medical Institute (AFMI) , Dhaka Cantonment authority will be published at their Notice Board at 29/11/2018. 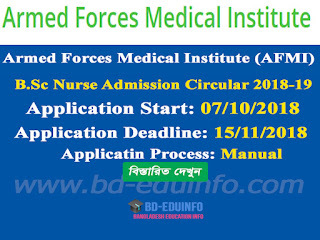 Tags: Armed Forces Medical Institute (AFMI) admission notice for B.Sc in Nursing, B.Sc in nusing, B.Sc in Nursing Admit Card 2018-2019, Armed Forces Medical Institute (AFMI) B.Sc in Nursing Admission Result 2018-2019, bangladesh nursing and midwife, nurse, nursing result, nursing and midwifery, nursing council, bd nursing job today, bd jobs for nurses, nursing job circular, bangladesh nursing, nursing bd, nursing job circular in bangladesh, nursing job in bangladesh, diploma in nursing science and midwifery, dns nursing, bd nursing job circular. Armed Forces Medical Institute (AFMI) Nursing Admission Exam Result. 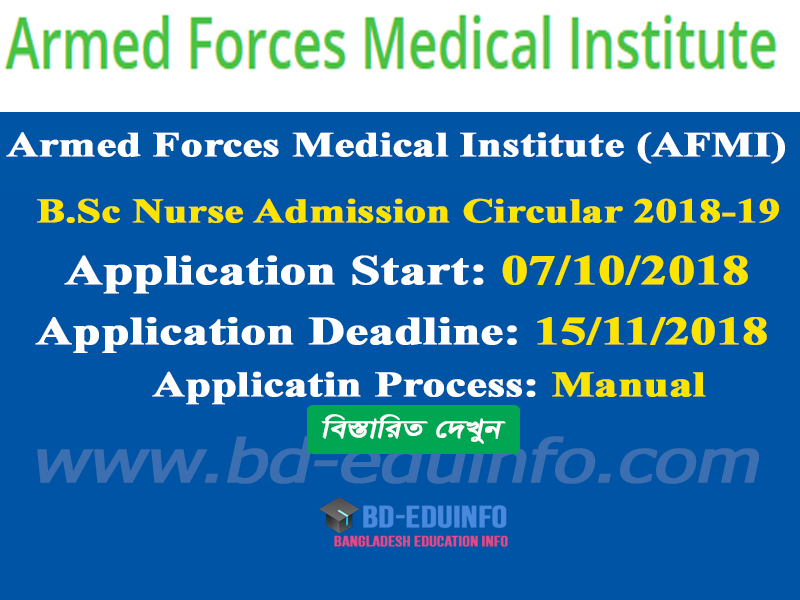 Armed Forces Medical Institute (AFMI) admission notice for B.Sc in Nursing, B.Sc in nusing, B.Sc in Nursing Admit Card 2018-2019, Armed Forces Medical Institute (AFMI) B.Sc in Nursing Admission Result 2018-2019, bangladesh nursing and midwife, nurse, nursing result, nursing and midwifery, nursing council, bd nursing job today, bd jobs for nurses, nursing job circular, bangladesh nursing, nursing bd, nursing job circular in bangladesh, nursing job in bangladesh, diploma in nursing science and midwifery, dns nursing, bd nursing job circular. Armed Forces Medical Institute (AFMI) Nursing Admission Exam Result.